Help Amelie turn a ramshackle hut into the classiest joint on the island as she caters to a variety of guests, keeps her cooks busy, and racks up big money in Amelie's Café: Summer Time. Earn bonuses as you play by mastering fun minigames! Staff and café upgrades will also keep you from going under. 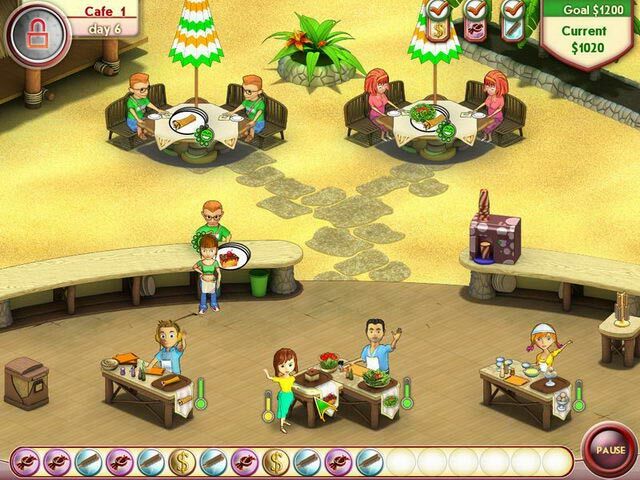 With gripping Time Management gameplay, Amelie's Café: Summer Time is your ticket to fun! 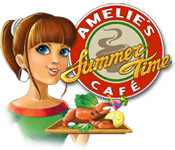 Amelie's Café: Summer Time is rated 4.0 out of 5 by 5. 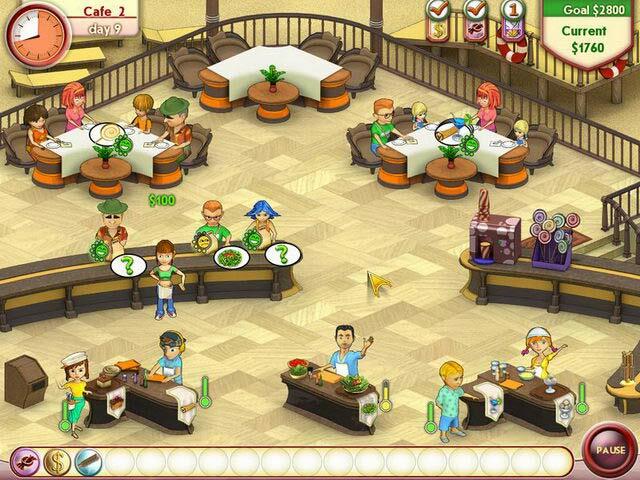 Rated 5 out of 5 by dagirli2002 from Love I love all the Amelie's café games. If you make any more... don't change it too much. That's what's always bugged me about making other additions of a game - being changed too much from the original. Only thing I'd add in a new game is an extra café level instead of just three. Rated 5 out of 5 by merlinarcane from A Time Management Foody Delight Game The Amelie series is worth trying out since you can actually complete the games and not be so stressed out that you can't think clearly! Clicking isn't too bad; the storyline is cute; you can replay levels to get better results -- the list goes on! The game has more things going for it than against it ... The game is divided into cafes that give you automatic new dishes, but you have to decide upon what types of upgrades you will buy. Obviously, the more money you make, the better upgrades you can purchase for either the staff or the cafe itself. It gets a little hectic at times, but you can win each level at Expert in the Career mode; I have not played the Survival mode for more than a few minutes (too much clicking and not relaxing). I recommend this series; the graphics are great and the game is something that you can complete and win! Rated 5 out of 5 by saulsangel from Excellent Game Great game all round. Exciting & Challenging with lot's of levels with all different scenarios. Rated 3 out of 5 by beatlesfan30 from It's too short Needs more of a story and longer. Rated 2 out of 5 by cjjerome from Repetitive with no goal My wrists and fingers hurt from all the clicking, game ended fast, did not have option to upgrade/decorate like I thought and did not know it would end so quickly without even knowing it. or I would have never bought it. That was playing career mode, I guess if you played survival mode the goal would be to get the highest score. 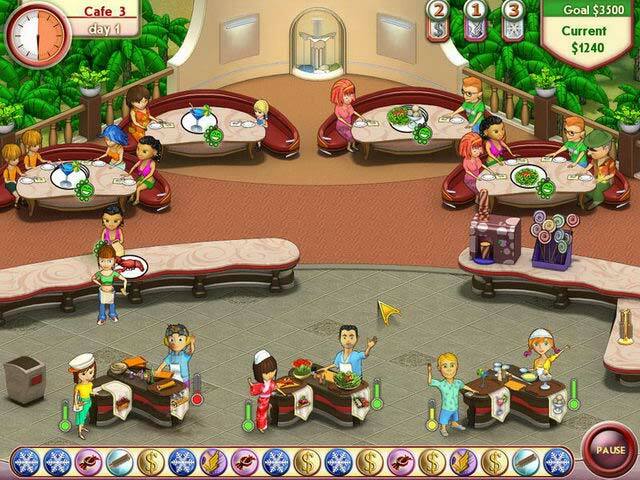 Help Amelie cater to a variety of guests, keep her cooks busy, and rack up cash in Amelie's Café: Summer Time!